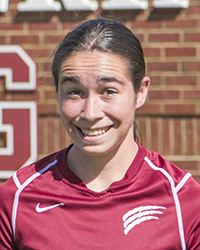 NOTES: Two-year letterwinner... 2015: Appeared in 15 matches as a reserve at multiple positions ... Recorded two goals and two assists for six points ... Posted a goal and an assist in win over Bethany ... Also added a goal in win at Thiel ... Registered an assist in Wolverines' ECAC quarterfinal win over Marywood ... 2014: Appeared in 10 matches after returning from an injury that cost her the early part of the season... Made first collegiate start against Thiel... Recorded an assist in win over W&J... Scored first goal as a Wolverine at Chatham.